‘It is rare, in the history of economic thought, for debates to get resolved this decisively. The austerian ideology that dominated elite discourse five years ago has collapsed, to the point where hardly anyone still believes it. Hardly anyone, that is, except the coalition that still rules Britain – and most of the British media’. In the aftermath of a shock Conservative general election victory there is inevitable fall out across the mainstream left and nowhere more so than in the Labour Party camp. I argue that ‘classical’ economics has become increasingly irrelevant in the new world. Comprehensive state control of the economy means that there is no economics now; only politics –and that is one party politics. Since there is no way to manifest and resolve differences through economics, culture is re-emerging as the defining pivot around which social conflict is based. With this in mind I argued that the Conservative victory was essentially the result of playing to a cultural constituency and not any economic rationale. Nevertheless, despite the widespread admission among the left that culture is raising what they regard as its ugly head, many on the ‘left’ are not willing to kiss goodbye to old fashioned economics just yet. Two camps are emerging to contest leadership of the English opposition in the aftermath of the elections. In the blue corner we have ‘Blairism’ and in the red corner ‘Keynesianism’ is being dusted off for a re-run against austerity. The nominal question being asked is: Which of these two economics can best offer an alternative to the program of the Conservatives over the next five years? Blairism was concocted as a replacement for the Keynesianism that had become discredited as a result of 1970’s industrial production collapse. Tony Blair famously signalled the end of independent political or economic perspective when he abandoned the Labour Party commitment to Clause 4 and wealth redistribution. Whatever opposition in Britain would be from now on, it would not be based on alternative political economy. Fast forward twenty years and post Credit Crunch, Blairism itself was utterly discredited. The gap between rhetoric and reality encapsulated in an infamous speech to the City of London in which Chancellor Gordon Brown opined that the world was witnessing the emergence of a ‘Golden Age of Banking’. Then came, well you know. Following a leadership election Ed Milliband appeared waving the banner of ‘Not Blairism’. That’s not rhetoric on my part – ‘Not Blairism’ is literally what Miliband said he was campaigning under! And now that ‘Not Blairism’ has been roundly defeated there seems to be nowhere left for the ‘left’ to go. Except perhaps back to Keynesianism, or Neo Keynesianism anyway. ‘I don’t know how many Britons realise the extent to which their economic debate has diverged from the rest of the western world – the extent to which the UK seems stuck on obsessions that have been mainly laughed out of the discourse elsewhere’. Even a superficial survey of developed economies would quickly show that this is wishful thinking. All across the globe there is a sustained attack on levels of government spending on social programs. This is Austerity by any definition. The difference between those countries that have severe Austerity and those that don’t is the willingness on the part of the broad population to oppose such attacks and its ability to do so. Austerity is not the consequence of any intellectual difference on the part of politicians and economists. Krugman argues that the drive for Austerity is motivated by business and media interests that are ideologically committed to ending the welfare state and which used the Credit Crunch as a pretext for doing so. This is essentially a variation on the ‘Shock Doctrine’ analysis popularised by Naomi Klein and this observation is surely basically right. From this position Krugman continues that Austerity is essentially an optional choice and that politicians could go another way should they decide to. The Keynesian alternative of deficit borrowing and spending can be used to refloat the economy or at least offset the effects of cyclic crisis. He argues this has happened to some extent elsewhere. He is at a loss to explain why it hasn’t happened in Britain. ‘Given the fact that the coalition essentially stopped imposing new austerity measures after its first two years, there’s nothing at all surprising about seeing a revival of economic growth in 2013’. So British polity is labouring under the grip of an ideology – except that it isn’t !?! ‘By this point, some readers will nonetheless be shaking their heads and declaring, “But the economy is booming, and you said that couldn’t happen under austerity.” But Keynesian logic says that a one-time tightening of fiscal policy will produce a one-time hit to the economy, not a permanent reduction in the growth rate. A return to growth after austerity has been put on hold is not at all surprising’. ‘Keynesian logic’ says that permanently lowering wages and benefits for the working population will not permanently lower their purchasing power and affect demand in the broader economy? It has been astonishing, from a US perspective, to witness the limpness of Labour’s response to the austerity push. Britain’s opposition has been amazingly willing to accept claims that budget deficits are the biggest economic issue facing the nation, and has made hardly any effort to challenge the extremely dubious proposition that fiscal policy under Blair and Brown was deeply irresponsible – or even the nonsensical proposition that this supposed fiscal irresponsibility caused the crisis of 2008-2009. It almost beggars belief that Krugman is seriously trying to imply that Democrats under Obama have offered ANY serious alternative to Austerity and that this response can be compared favourably with anywhere else in the world. And yet here we are. 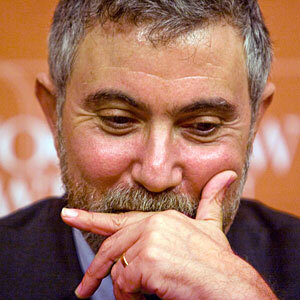 How can Krugman have drifted so far from reality? The answer lies in his ‘Neo’ Keynesianism. Which is something of a revelation, at least to me. I certainly had never heard of ‘Austerians’ before I read this article; but then again, I don’t move in ‘economic circles’. Krugman is obviously reluctant to name his opponents as Monetarists, which is what they are. What could be the reason for his coyness? Democrats in the USA and the Labour Party in Britain both accepted the basic principles of Monetarism over twenty years ago- ‘Blairism’ in Britain and ‘Clintonism’ in the USA. Krugman has no interest in discussing this history because if did, he would have to criticise the so called ‘left’ as much as the so-called ‘right’- if he was really a Keynesian, that is. And whatever else he is, Krugman is essentially a party man. This is breathtaking, absolutely astounding, cynicism. Krugman is hanging the pretence that Democrats can lay claim to anti Monetarist Keynesianism on the fact that they weren’t actually caught with their paws in the Monetarist cookie jar in 2008! The economy is now controlled by the state. This is Monetarism. There is no possibility of economic conflict as we have previously understood it. Now conflict is cultural. Now Labour needs an alternative to Blairism. The remains of the ‘left’ hope it can be built on Keynesianism. But this can’t happen because no genuine Keynesian could support a Monetarist Labour/Democrat party. So now we have got Neo Keynesians, which are Keynesians that accept Monetarism. Neo Keynesians argue that so long as we don’t actually get caught directly implementing Monetarist policies, we can perhaps convince people that we are Keynesians (sort of). If we do this we can pretend that there is some kind of economic alternative. Which implies that some kind of economic debate is possible. Which means that the debate does not necessarily have to come down to culture. Because if it does, we are well and truly f*cked. Putting all the cynical narrow political interests of ‘economists’ like Krugman aside, would it be possible to actually implement some kind of Keynesian alternative to Monetarism? Regretfully, the answer is no. As it develops Capitalism increasingly makes stuff that is increasingly useless by processes that are increasingly inefficient and chaotic. But not to worry, Capitalism has an app for that. It is called economic collapse brand name ‘Creative Destruction’. All the bad stuff is wiped away and we can all start again. Which is fair enough. Except that when ‘Creative Destruction’ was first cited as a good idea, there were a lot less people who lived in a much more resilient and sustainable way. In USA for example, the European population lived in relatively dispersed settlements with reasonable access to necessities such as food and water. When there was the inevitable economic crisis and clear out in the late C19th, it could be weathered by the population without much government interference. But by the early C20th, urbanisation and the concentration of populations meant that it was not possible to have a Capitalist clear out without catastrophic social consequences and unrest. So the state had to get involved. The basic idea of Keynesianism was to use government spending to buy up all the useless inefficiently made stuff that capitalism has produced and so avoid the catastrophic social consequences and unrest that would come from the inevitable clear out we would otherwise have to go through. The basic idea is that the state cannot afford to pay to buy all the useless stuff that is being produced, since in theory the amount of useless stuff is limitless. So the state is going to have to control what is being produced. But the state will try to keep this control to a minimum. And this worked reasonably well until the turn of the century when the state found itself having to interfere more and more to try to control what was produced and what was done with the stuff once it had been produced. And this took us finally to the Credit Crunch in 2008. And with Q.E. now the state is all in. So contrary to what the Neo Con/Neo Liberal whatever say about the Neo Keynesian whatever, a return to Keynesianism would actually represent a step backward from the existing level of state interference in the economy! Its Monetarism and Cultural Constituencies from here on. December 2014 I named 2014/15 as the Year of Culture. In that piece I described the first signs of a rise of social/political blocs based not on economic rationale, (the ‘traditional argument’ about the production and division of wealth), but on sub national groupings I characterised as cultural constituencies. I described examples of Cultural Constituencies around the world, including the Scottish National Party in the British Isles. I predicted that the recent referendum for Scottish independence (although it ended in defeat), was far from the end of this cultural dynamic and that the rise of the Scottish National Party would inevitably have an effect on British polity. So much has been proven to be the case, but the results of the recent British General Election offer more insight into cultural constituencies. Against every prediction and poll that preceded the election, the Conservative party managed to obtain an outright majority in the House of Parliament. This means that they can implement a political program without the need for coalition. In contrast their Liberal Democrat coalition partners saw support in the country collapse. This was another cause for some surprise. After all the logic goes, if the Conservatives get credit for the past five years, why do Liberal Democrats get condemnation for exactly the same program? The Labour Party, despite the anticipation (at least on the ‘left’) that their campaign would take flight, stalled in mid air and then nose dived straight into the airstrip. Again, everyone professed surprise. Not me though. ‘Ed Miliband is being slowly skinned alive by the press in England. Every day there is a fresh story detailing Millibands latest fall in the polls and warning of the terminal damage he is doing to Labours chances of getting elected next time. It’s not only the press pack who are on Milibands tail. It seems that an ever larger group of his own MP’s are openly briefing against him as well. So what is the cause of all this dissension and hostility? I made it clear that the question of Ed Millibands ‘fitness’ to be prime minister was decided there and then. The press and political insiders continued their campaign of vilification. The result was inevitable. But this alone wouldn’t explain the story of how Labour busted out in their traditional heartland of Scotland- reduced to just one seat! The Scottish response to Milliband was an exact mirror image of the English response. Whatever the English liked about Milliband, the Scots detested and visa versa. This in turn has provoked an intense battle to interpret the meaning of the election result -just as the meaning of the referendum is still contested long after the result was supposed to be sealed and delivered. The key to this struggle is Gaelic identity (characterised in Saxon media as ‘dangerous’ and ‘destructive’ ‘nationalism’), against Saxon identity. It seems that every Saxon pundit has been mobilised across the territory to destroy the very idea of an alternative to the Saxon mindset in these islands. This is especially true of the so called Saxon ‘left’. It looks like a national media wartime mobilisation reminiscent of EuroMaidan Kiev. Redrawing the electoral boundaries within England, making it virtually impossible for the Labour Party to ever win an outright majority again. In the midst of all this domestic constitutional upheaval, more conflict is set to crystallise around the promised referendum on EU membership. The Saxon Maidan could quickly start to look like a northern SYRIZA fighting against the continental Germans. With this rather more sober perspective on a Conservative victory, it starts to look like success for the Conservatives might prove to be something of a poison chalice. So why were mainstream Conservative Party hacks willing to bid themselves into a potentially perilous and marginalised position? The answer can be found in the fate of failed party leaders Ed Milliband of the Labour Party, and Nick Clegg leader of Liberal democrats. 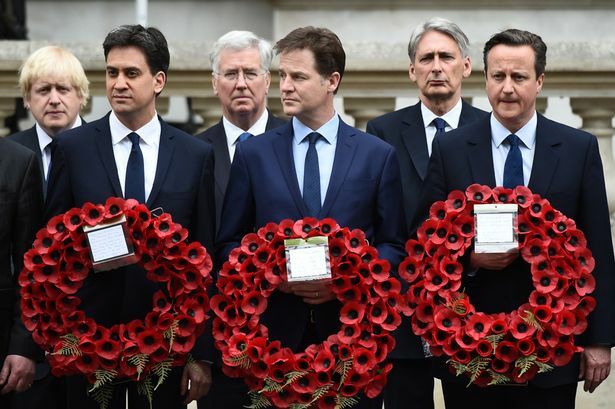 Consider the striking image of three main party leaders at the Cenotaph for the VE DAY celebrations, two of them political dead men walking (their resignations were already common knowledge). This is a graphic illustration of the danger of failure in this febrile contemporary political atmosphere. Political ghosts at a political funeral. And the system and the position of its major actors is even more brittle than appears on the surface. The cost of political failure has gone up considerably because the analysis underpinning individual politicians is no longer trusted. In the Good Old Days there were a couple of alternative approaches to politics based on economic rationale. You were either in favour of redistribution or you were not etc. Individual politicians might be challenged, but the ideas behind individuals were sacrosanct. It was simply a matter of finding individual politicians to represent the idea. But now Ideas are to be discarded along with the people who came up with them. Because these ideas don’t represent economic rationale which is universal but cultural constituency which is specific. The politician no longer REPRESENTS the universal ideal, the politician IS the cultural specific. Once you understand this, Barack Obama and Hillary Clinton and David Cameron and Jean Marie Le Pen and Vladimir Putin all start to make a very clear kind of sense. There can be no doubt that this VE day marks the end of an era. For the first time since the end of WWII ‘western’ leaders refused to turn up for the Victory Parade in Moscow. The message here is unmistakable. Another major piece of the international post war settlement is broken off, dead and gone. But this is an indicator of something even more profound. Just and the international post war consensus is over, so the domestic post war consensus is finished also. Which brings us to the Conservative surprise victory and in particular the size of their majority which exceeded even revised exit poll estimates produced on election night. Permanent reduction in the size of the state and welfare. Possibly leaving the European Union. Conservatives are floating the idea of federalisation with Scotland, this will cause consternation throughout the old guard of the establishment. In addition to this innovation, as part of ongoing negotiations with the EU they will try to form a bloc of nations to enhance their bargaining power. This will confound the commentariat in the press. The Conservatives can reach an accommodation with the SNP but NOT with the BBC and the British Medical Association and the Guardian and so on. What commentators don’t understand yet is that cultural constituencies are all about settling internal scores, in some sense externalities are almost an irrelevance. Economic demands secondary or irrelevant. The Saxon cultural constituency is an economic disaster for working class people. It will achieve for the material well being of English society as a whole what the Kiev government has achieved for the majority of Ukrainians. The Conservative party is run by a cabal of elite public school educated multi- millionaires that express the material interests of a tiny minority of English society. This observation is not seriously challenged by anyone within the English media. The gulf between the political elite and the hoi polloi is summed up by the incident in which David Cameron forgot which football team he supposedly ‘supported’! The bizarre dislocation between fact and fantasy illustrated by Camerons gaffe went largely unremarked because now there is an unspoken agreement among the Saxons. There really is a conspiracy here! No more dissent within the ranks of the Saxon cultural constituency. The fact that Poroshenko is a billionaire and represents the interests of an economic elite makes no difference to the Ukraine Maidan. Just as ‘Economics’ makes no difference for Maidan Ukraine, ‘Economics’ will make no difference for Maidan UKraine. which encapsulates cultural constituencies to a tee. 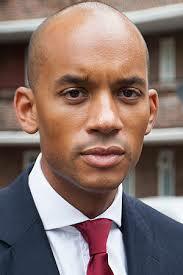 Chukka Ummuna widely seen as the heir apparent to the ‘Modernising’ wing of the Labour Party threw his hat into the leadership contest and then…er took it out again. Now why would that be I wonder? The politician no longer REPRESENTS the universal ideal, the politician IS the cultural specific.